Dogma, the Earl of Poor eating comes to train high school student Satoru into the perfect chef. But what awaits Satoru at the end of his training is only death. His teacher is not an ordinary noble but a demon from hell who promises to eat his soul, spiced with a lifetime of cooking expertise. Will Satoru abandon his normal life to become the puppet of this demonic earl? How will he cope with his life's expiry tag? Let's have a taste of this Heresy Gourmet! Ehh a cooking manga. I started this manga because the cover art looks nice, and the story seemed okay as well. I didn't really know what to expect from this title since I knew nothing about the story beforehand, but after gulping three volumes (in under an hour) it was... meh. Story seems interesting, albeit with a really overused cliche that follows the our-main-character-is-plain-but-one-day-somebody-comes-and-wrecks-his-everyday-life formula. I haven't actually read a manga where that somebody who wrecks the main character's everyday life is an Earl from Hell, and that he's planning to eat the guy later! But in the end, the story lacks depth. It fails to get you emotionally attached or just simply wanting for the story to continue. Finishing volumes after volumes I was only like "eh ok" "right" "off to the next volume" without getting my interests piqued... the story seems dull and the main character currently hasn't got the drive or a goal to follow, so he's just getting dragged along everybody's pace. The comedy is funny sometimes, but there is too much abuse for me to wholeheartedly enjoy this haha. Technically speaking the cooking isn't also convincing either. I mean, the main character is always up to battle with sophisticated cooks with over-the-top skills, and he always ends up winning because of one small advantage. Like, putting dirt inside your cooking beats a shining, sparkling dish of fine ingredients? It lacks explanation and in the end you'll just go "what?. The battles are unrealistic and anticlimactic and simply doesn't live up to the standards the previous cooking mangas I've read have set. The art may be the best part of this manga though (simply because everything else seems dull). The cover art is what got me interested, and the art doesn't disappoint me. But it's not THAT great either... a certain cooking manga I know has this really splendid, sparkly shiny art that sets the bar too high. Characters are, eh, bad. Throughout the three volumes I've read only shows Satoru being beaten and abused by Dogma, and that one thing simply doesn't change! Satoru is very weak-willed, while Dogma is originally a Hell resident with very bad temper and violent streaks, and this combination hurts my eyes and brain. For a shounen manga protagonist, Satoru is too... weak. He hasn't shown any character development at all from what I've seen other than growing just a tiny bit of balls to finally make his own decision sometimes (after getting a beating or two from Dogma, of course). On the other hand, the side characters are a lot more interesting. I have forgotten their names but there's this cooking-prodigy kid who's an absolute freak, and a spices-otaku guy who is also a freak. Satoru's crush is also a really interesting character. But well, as this is a comedy manga, don't expect for them to leave any lasting impression on you. Actually, I enjoyed reading this. It's just that stupid, comedic, and I really can't feel the emotions, but that makes me relaxed. I read three volumes in mere three hours and well, I felt refreshed. Reading complicated, deep stuffs also hurt my brain and I need a rest from the mindfucking series. To sum up, Hell's Kitchen is a fun read you'll want to enjoy on Saturday evenings, when you've got absolutely nothing to do and you're too stressed to read the actual good stuffs. I jumped into this manga even though I was somewhat aware that this series was dropped. However, in order to quench my thirst for manga and from being tired of searching for a good manga that suited my taste, I decided to dive into this one since the ratings seemed somewhat decent. The story is quite simple - a devil (Dogma) is thirsty for a soul to consume; the soul of a 'true chef'. He has met so many chefs but their souls tend to be corrupted with pride, greed, and arrogance which leaves a bad impression on the devil. So he meets an ordinary innocent boy (Satoru) and the devil wants his soul but the soul isn't perfect for consumption since the boy has no experience in cooking whatsoever and so the devil takes it upon himself to perfect this boy's soul via cooking since after all he is after the soul of a "true chef". The devil has a lot to do in order to perfect this boy's soul and thus the process of the boy maturing through the culinary world is what this manga is about. The idea behind most chef manga tend to be the learning, maturing, and bettering a young chef's skills/talents hence making this story concept anything but new. However, the author does a good job in keeping you turning the pages with it's comedy and, well, also the characters. The comedy, I believe, is what makes this manga to be a fun read. The idiot friends that Satoru gains, the humorous ways the characters are introduced, and the countless torture Dogma puts Satoru through all while having a sadistic smile on his face is quite funny. And the artwork helps alot with the comedy scenes by portraying them well. My only disappointment is the way it ended. Like i stated above, I knew this was a dropped series but I was hoping the author might have ended it in a more better way. The last chapter was getting to be really interesting and serious. It almost felt like a new arc was about to take place. Plus the manga was mainly about Satoru's world but I felt the last few chapters was going to go into Dogma's world so I thought we would have a chance to get to know more of him but that did not end up being the case. Ah, this was a good manga but I really wish they would ended it properly or just continued until a proper end was reached. 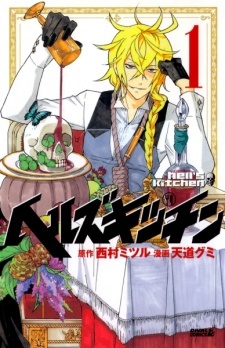 When looking at the cover art, you might think something like, "A manga about a some bishounen underworld guy who cooks or whatever ('cause that's what I originally thought)," but what you get is something very, very different. Like I said, it's different from my impression of it and I am so glad it is. Story: (some spoilers will be coming ahead later) It's really something when a manga is able to knock out every other favorite I have and achieve top rank. This doesn't apply anymore as I'm re-editing this review a bit, but it definitely did achieve that for awhile in the past. Unfortunately, I should say this now. It really is superb story-wise until the manga gets to a certain arc. At that point, it's just not that amazing anymore, however. It redeems itself after because everything comes together. Trials that were just whatever end up forming something moving in the end. How can a manga about cooking be so great? Hell's Kitchen is about how the Earl of Poor Eating is tired of only consuming souls of experienced, but conceited, immoral chefs. So he comes up with the idea of possessing your most average and normal person... the protagonist of course. With this, you're invited to the wacky, but highly creative and well thought-out adventures he has at a cooking academy for very talented teens. The techniques in this manga are REAL. They're so odd, but if you research them, you find out that they're actual skills that are used, and the cooking elements are in fact, fact. I figure I should stop here because I'd be spoiling more, though. An important fact I should include is that re-reading this as I'm older made me realize that it has some very touching and realistic moments. As in the way the characters react really speak to you. I'm mainly talking about those times where there's a sad time or after a... oops I nearly spoiled you there (no, it's not a character death if that's what you were thinking). Art: At the beginning, the art style for Hell's Kitchen is ehh. Once you get into it, which will be near the beginning, you disregard the art completely. The only way I realized that the art isn't that great, was that I re-read chapters when I got caught-up. (I purposely held this off for weeks because I didn't want to catch up) Even so, the art is decent and above average. You'll notice some mistakes if you look, but it's all right otherwise. It's one of a kind and enjoyable nonetheless. The art styles and character designs give off a lot of personality that is practically oozing out from the characters. Characters: Oh, of course, the characters themselves. The ones in this series are quite lovable, even with their flaws. They achieve their own personal, original flair. There aren't a few or too many characters, but there's a good amount. From this, I don't remember if -all- of them have backstories, but a lot of them do. Some are short, but still provide enough, and others are split. You'll have a backstory reveal, but learn later on that there's more to their past and reasons to why they're the way they are. The characters aren't just your overused, recycled character archetypes, which are pretty common nowadays. Nearly all of the characters are real likeable- even the main antagonists at times. I really like a lot of the cast; they're very colorful and have great personality for the story. It's hard not to get attached to them. If it wasn't obvious enough, I enjoy this manga, and I really don't know what I did to keep myself from waiting for new chapters. ...but like I said before, with the current chapters, it lost it's brilliant shine. I hope it becomes amazing again. Oh, this manga has great humor, but the omakes are even more gold. Even excluding the omakes, the manga still has good humor. All in all, you should give it a go! It doesn't matter if you're a shounen or shoujo fan, you might just love this. A good-for-nothing child is chosen by a demon whose sole purpose is to consume the most delicious souls. The demon decides to "tutor" the said child and make him into the "soul of a true chef". The story focuses on the boy's journey as a budding chef, and all the eccentric characters he meets. And he meets plenty of them. A fangirl whose only love is knives, a masked boy with an extreme dedication to spices, and many others. The artwork is quite stunning. I take minor issue with the shading in some instances, but it still fetches an overall rating of 9. The food art is impeccable- I guarantee it will make you hungry. The character development is running quite smoothly, and the plot is well-paced. All in all, this is a fun, if a bit outrageous, manga that I would recommend to just about anyone, especially foodies.